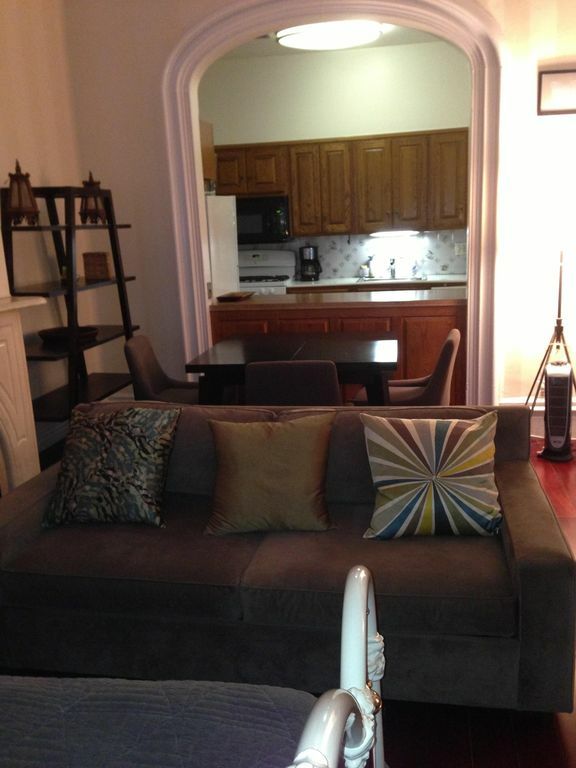 Midtown, Grand 01 Studio ouvert pour 5 personnes, balcon sur jardin, bonne affaire! Grand appartement privé d'une chambre avec 1 salle de bain. Espace extérieur avec des chaises de balcon et une table donnant sur un jardin privé dans Midtown West / Hells Kitchen townhouse. Cuisine de grands chefs, lit queen dans la chambre principale, un lit double qui fonctionne comme un lit de repos pendant la journée, et un canapé-lit queen size. L'unité peut accueillir jusqu'à 5 personnes. Très bien situé près de Times Square, Central Park, des restaurants et du théâtre qui est parfait pour une escapade d'un week-end! Interphone vocal dans l'unité et bâtiment privé et calme pour votre plaisir. Une fois les frais de nettoyage. Je suis impatient de faire de vos rêves de vacances une réalité. Je suis une vraie personne et n'ai aucun problème à parler avec vous et aussi avoir une conversation Skype avec vous si vous souhaitez le faire. Je demande à tous mes invités d'envoyer une pièce d'identité avec photo émise par l'État avant de venir. Dépôt de 500 $ (non remboursable) sur réservation déduite du loyer mensuel. Proche de toutes les commodités. Entre Central Park et Times Square, les commerces et les restaurants. Tout peut se faire à pied. Les fenêtres donnent au calme sur une arrière cour, dans une rue peu passante. Seul petit bémol, certains meubles nécessiteraient une remis en état mais l'ensemble est satisfaisant. Nous avons passé, ma femme et moi, un agréable séjour. Great location and a kind responsive host. Due to construction debris and nesting pigeons (and subsequent bird droppings) balcony was unusable. A space heater was provided but still very cold in the evening. For some reason, heat came on the last day and got plenty warm. Was unsure how to adjust but didn’t bother the owner seeing as it was our last night and a Sunday night. This was a great place for our purpose. I took my nine year on a vacation to the big Apple for her spring break. This apartment is in a fantastic location for all the major kid appropriate hot spots in the city. The street was quiet and we felt very safe. I would say if you are looking for a place to rest your head and have a kitchen for snacks with a nice warm shower this is a great place to stay. The kitchen is not stocked like most places I have stayed. The kitchen had bare essentials so if you are looking to cook elaborate meals you will have to do with one pot and one pan and would have to buy basic essentials such as salt etc. the patio unfortunately is not usable at all. The pigeons absolutely love the space but that’s New York for you! Overall we had a great stay, loved the apartment for it fit our needs. Thank you for sharing your place! We were looking for a place to sleep for an evening after we wondered about for Christmas decorations and meet up with friends local to the area. The place was very clean and had only the very basics. The architecture amused me as I tried to imagine what the building once was, the plaster ceilingmust have been gorgeous at some point. While I was not overly impressed with the decor of the room, I didnt really need much. My biggest issue was the bed was so hard we did not get a great night's sleep. I like a firm bed but the carpeted floor might have been softer then the bed. It needed a pillow top or something. And it was cold but we did not see an extra blanket anywhere so I ended up sleeping in my hoodie. The location to the center of the city was great. Some like a firm bed, some don't. I have given up trying to please all. ITs a firm mattress but never get complaints about it so there is a first for everything. The good: location, and cleanliness. Easy to get anywhere from Hell’s Kitchen location, plus several restaurants close by (hey, it’s NYC). Place was very clean. The bad: it was one big room with 3 beds, plus a table with 2.5 rickety chairs. Kitchen was ok, had minimal requirements (a few dishes, glasses, pot and pan, toaster). But it seemed that the owner is doing the absolute minimum to maintain the property. For example, there were no lampshades on the lighting- just bare bulbs giving off bright harsh light; the chairs were unstable and there were only 3 (place “sleeps 4” - I guess that is accurate, but it doesn’t “sit 4,” which would have been nice for meals). There is almost nothing else there - owner even made a point to say there would only be 1 roll of toilet paper (there was no interaction, just terse and rather stern instructions about what to do). I came away with the idea that the owner was doing me a favor by letting me pay to stay there- overall tone was unfriendly. I think that for about 50 bucks at Target it could be a much more comfortable place - a couple folding chairs, some lampshades, a couple of non-institutional towels that aren’t threadbare, a roll of paper tolls - not asking for the Ritz, but a few minor amenities might be nice. Also clean the freaking pigeons off the back deck - they made noise all night long (a well-placed 2x4 would take care of it). Would not stay again. I often chose never to respond to comments in this case I must. Professional and respectful and am friendly but I will never hit the perfect note for all . Unrealistic expectations, but I am here for guests should they need me. This particular guest did not reach out whatsoever during their stay and voice any dissatisfaction. As for my terse and stern instructions I aim to be clear so guests have a realistic view of what the home is and also what it is not. Sorry I did not write instructions in a way you found pleasing and would seemingly imply my state of mind and my attitude toward my guests in general? Really?
. As for toilet paper I offer a starter roll and yes you need to to take care of yourselves it’s apartment style living. As for your post stay suggestions for pigeons which I can assure you are a NY phenomena that a 2 x 4 cannot prevent. Wish it could. I really hope that You are happy you saved money for your families stay rather than staying at a hotel. I am in total agreement that you should find a place that meets your needs and hope you enjoy your next trip . This apartment was wonderful. It was easy walking distance to the Intrepid museum, Times Square and Central Park. The kitchen was large for the space and the room was a good size. We checked out early and left our belongings in the hellway and had no issues when we came back to retrieve them later in the afternoon. The only downfall of the space was the very small space heater which did not heat the room much and the very small sink. Neither was a big deal in the end. The bed was comfortable and was just what you needed to get a good sleep after a long day of walking and touring the city. Back porch was also nothing great and was full of pigeon poop, since it was winter we didnt really go out there. Would have been nice to have cleaned up though. All in all, great place to stay and a good price. À distance de marche de Central Park, Broadway, Times Square, restaurants, AOL Time Warner Building. Au centre de tout cela! Le propriétaire fournit des coupons pour économiser de l'argent pendant votre voyage - s'il vous plaît demander!